It is no secret that we are fans of Chiranjeevi, masala, action, dancing, convoluted stories and crazy outfits. State Rowdy fulfils many of our film wishlist items. In addition, this film is often cited as the inspiration for Pokiri/Pokkiri/Wanted. 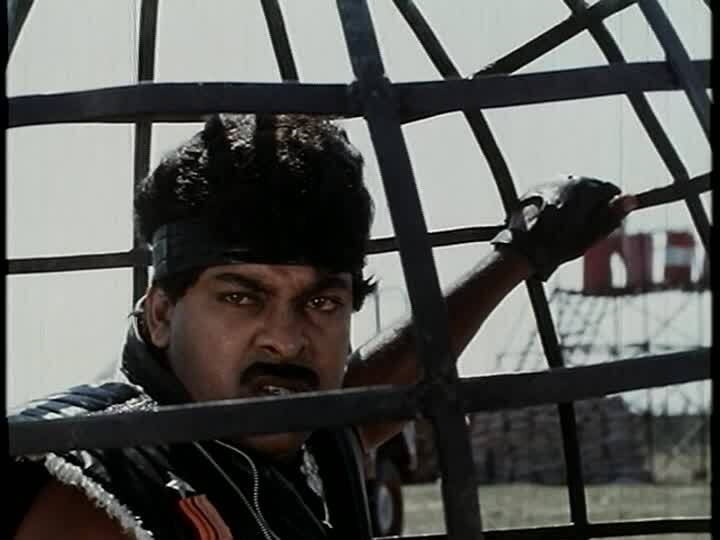 Chiranjeevi plays Kalicharan – the local tough guy, self designated State Rowdy and goon with a heart. He systematically takes on and eliminates all other rowdies on his turf (the coastal rowdy, the Rayalaseema rowdy, the Nizam rowdy …you get the picture). Bhanupriya plays Asha, a local girl who witnessed a murder and flees the scene. The killers know she saw them, but don’t know who she is. The SP (played by the impressive and elegant Sharada) also wants to find Asha as the murdered man is the policewoman’s husband. And oh yes, she is the long lost daughter of… never mind. Just go with the flow! Kali and Asha cross paths and romance sparks – especially once she gets an eyeful of his manly dance style and gold tipped boots. The police try to find out who is kidnapping all the rowdies, and the goons plot to rid themselves of the menace who is kidnapping their men. Meanwhile, the lovely Radha pines over her lost love Prithvi….but how is this all related? Just to add to all this confusion we also have local crime lord Narendra Bhupati, his merry band of brothers one of whom was responsible for the murders, and local businessman and would-be CM Mankamatti Bhaskar Rao who are all searching for the eye witness for various reasons. All paths lead back to Kalicharan. Through a series of slightly confusing but very charming flashbacks we learn of his early life as good boy Prithviraj who wore white pants and parted his hair neatly on the side. Prithvi was a promising police cadet but was apparently passed over for promotion, had a spat with his superior, and left the force. His life went off the rails and he became the scourge – Kalicharan. Radha (played by Radha), Prithvi’s cousin and fiancee, discovers his double life and engineers an emotional confrontation between the headband and muscle shirt wearing Kalicaharan and his sari clad mother. The truth behind his fall from grace is revealed and like all things confided in secret, becomes well known in no time at all. All parties seek to use him to gain victory and to exploit his vulnerability while he strives to achieve his goal and protect his loved ones…and keep the girls from learning of each other’s existence. Displaying a fine sense of political fair play he accepts payment from opposing sides and splits his resources to cover both obligations. And then resumes his policing career. There are kidnappings, mistaken identities, corpse swapping, and that’s not even the tip of the iceberg. Once again, these succeed because Chiranjeevi is believably physical and heroic. From a heavily customised budget friendly Bond style motorbike to the thrilling conclusion, the laughs and gasps just keep coming. The climax scenes involve a return from the dead (that corpse swapping incident), kidnapping, blackmail, a masala death trap of delightfully rickety and impractical design and a lot of explosions and crashes. And a brilliant sequence with Chiru, trapped inside a spherical metal cage, being used as the ball in a game of car-soccer. We said this got a bit convoluted! Chiranjeevi is in fabulous form. Even in this broadly drawn character he manages to convey some nuance and a deft comedic sense. Prithvi’s flirting with Radha is sweet and a bit awkward and a total contrast to the swaggering Kali. There is drama, emotion and romance galore and his performance hits all the right notes. He seems to be having a fine time in the action scenes, and his dancing is fabulous. He even puts in a brief appearance as Arjuna in full gilded kit. One thing we just love is that he never seems inhibited by even the most peculiar wardrobe choices. In fact, he looks so happy and as if this is all huge fun for him. We must make special mention of the costumes, especially in the song sequences. Even for 1989, and allowing for flights of fantasy and a bit of a fashion time-lag between Paris and Hyderabad, there are some absolute shockers. The star cast give the songs a boost as they all throw themselves into the choreography. Bappi Lahiri does his disco thing and the songs are really catchy and fun. The supporting cast are all solid and do what they do in every film. 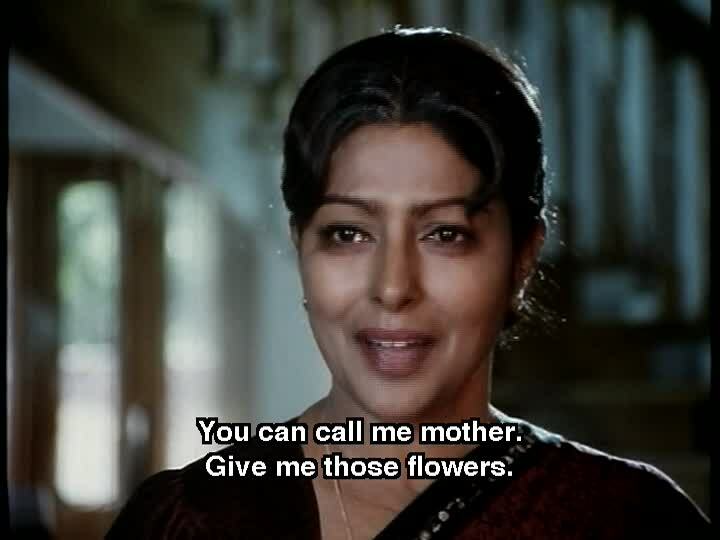 Sharada has credibility as the angry SP and as the grieving widow and mother. 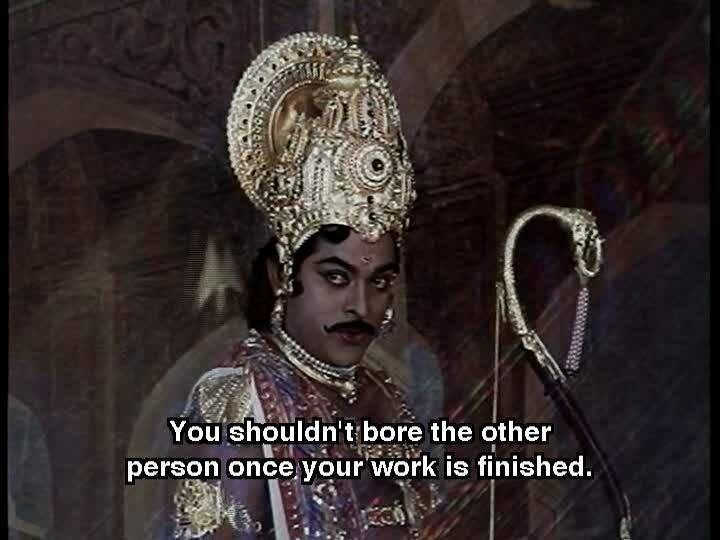 Allu Ramalingaiah plays Quotation Chakravarti, part of the comic side plot, and is very effective. We struggle with many of the comic side plots but this is fairly well integrated into the story so works better than some. The stunts and fights are so over the top and fantastic to watch. Once again, these succeed because Chiranjeevi is Chiranjeevi. Of course good will triumph, love will find a way and justice will prevail. But we encourage you to watch the film to see how much fun the journey to a foregone conclusion can be! Heather says: This has to be one of the most bewildering films I have watched for some time. The plot is incredibly convoluted and the various relationships of the characters to each other didn’t seem to be necessary for the story but just added to the confusion. I felt that there were really two separate films rolled into one, but this did have the advantage of giving us two Chiru’s. One suave, charming and dedicated to fighting crime, and the other tough, street wise and just dedicated to fighting. He is fantastic in both avatars, and the switch between the two is very clear and well defined. The female leads – all three of them – deliver some very fine performances, as do the supporting cast. While the songs themselves are great, they seemed to be oddly placed in the narrative. The really terrible (and therefore fantastic in a ‘so-bad-its-good’ way) costumes didn’t help with this sense of displacement and for me, detracted from some very good choreography. 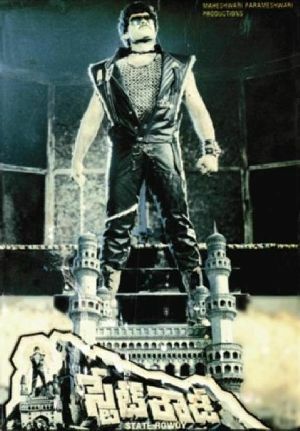 The dancing and action scenes were of a very high standard, as we’ve come to expect from a Chiranjeevi film, but what stood out for me was the dancing of both Bhanupriya and Radha. Both kept up with Chiru and managed to make their moves look effortless. Despite the confusing storyline the film is great fun. My advice is to forget about trying to understand what is happening and why, and just try to keep up with the action! I have to say that Chiru in a uniform makes any amount of mystifying storyline watchable. And since everything works out in spectacular style by the end I would recommend this film as a must see. 4 stars from me. Temple says: I didn’t find the film all that confusing, just unnecessarily convoluted and a bit fragmented as it relies on flashbacks to fill us in on the story. But it is immensely enjoyable as it plays around with the rowdy stereotypes and allows Chiru to be both the good boy and the dangerous ruffian. There is a common theme of justice in many Telugu films, and a few interesting takes on what justice is. In many instances it seems that despite what the law says, if the consensus is that a good man kills a bad man, then that’s probably OK. These themes do get a work out in State Rowdy but ultimately the law is seen to triumph; albeit with some help from the invincible Chiranjeevi and the determined Sharada. In addition to the excellent acting, the director decided to unleash the full might of the wardrobe team and make sure that Prithvi and Kalicharan looked nothing alike. Some dubious, but very entertaining, outfits were the result and the backing dancers and support cast enjoy the fruits of these labours too. And the ladies didn’t fare much better. For the most part the songs were reflecting the heroines’ wishes or dreams so they didn’t have to look at all realistic or be cohesive to the narrative either. The more pertinent question would be why, if you are fantasizing about a man, would you dress him up like that in your imagination? So much shiny metallic lycra – it’s quite concerning! I was going to say “less is more” when it comes to costumes but that might be misconstrued so let’s just move on. The support cast were very good, and there were some amusing little subplots and throwaway lines in amongst all the dancing, prancing and biffo. I found this very entertaining. I like detail, and this film has lots of it! I know this might not be to everyone’s tastes, but if that is the case then I think there is something wrong with you. 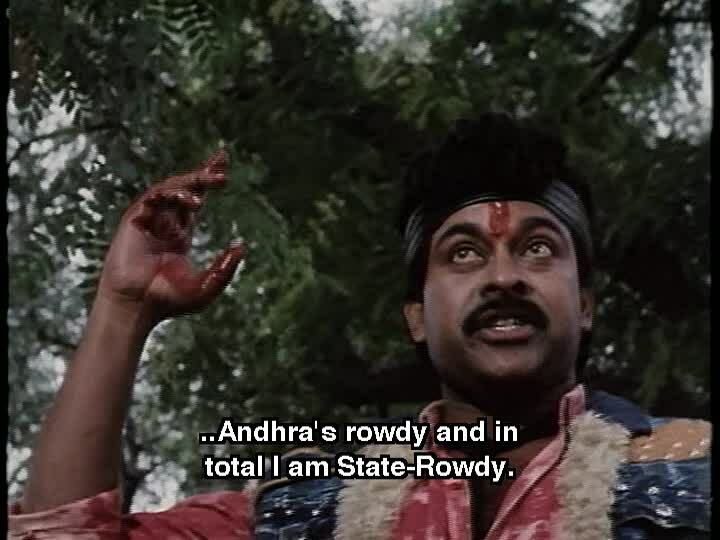 Chiranjeevi is just awesome as State Rowdy. I give this 4 and 1/2 stars! This entry was posted in Tollywood and tagged Allu Ramalingaiah, Bhanupriya, Chiranjeevi, Chiru, Radha, Sharada, State Rowdy, Telugu, Tollywood. Bookmark the permalink. I am probably one of the wrong-havers Temple is referring to but I _am_ very intrigued! I ahve enjoyed the songs from this immensely, and the addition of a masala death trap and American Gladiator-style car soccer is very pleasing indeed! And how could I possibly resist a film whose wardrobe department has been given free reign? sorry for the late reply.i watched this movie a long time ago.i dont remember anything other than the basic plot.”………………. 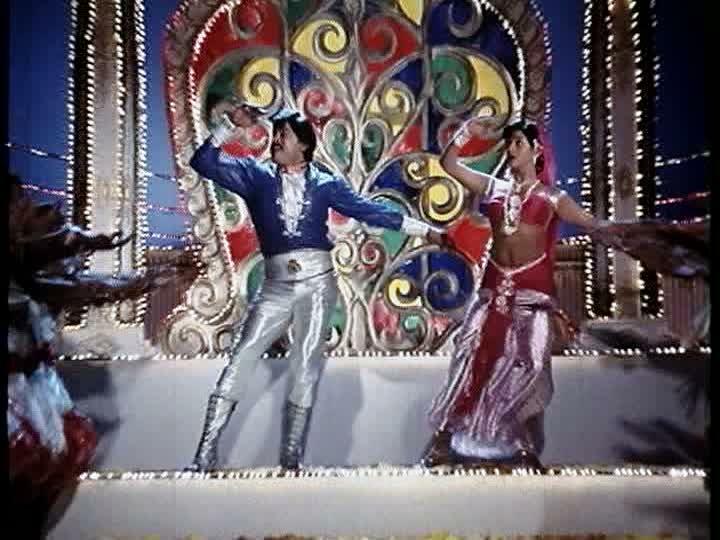 the dancing of both Bhanupriya and Radha.”my mother used to tell me that radha was considered the only heroine who can match chiru at that time.Bhanu priya,of course,is a fantastic dancer.i dont remember the movie but enjoyed reading ur review.keep on posting.